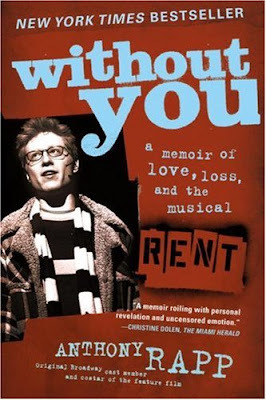 I finished reading a remarkably poignant memoir recently titled, entitled Without You: A Memoir of Love, Loss, and the Musical Rent, by Rent lead, Anthony Rapp. The book is primarily about the actors experience in the Pulitzer Prize and Tony Award-winning musical, Rent, which was a groundbreaking new musical theater experience when it debuted on Broadway in 1996. The story of the play itself is remarkable which was makes Rapp's memoir riveting. For those unfamiliar, here's why: Rent was written by Jonathan Larson, a completely unknown playwright and composer before the show opened. It is a rock musical based upon Puccini's opera La Boheme. At one point in the book, Larson tells someone that he is going to change musical theater, which is what Rent did accomplish. It truly created a new sound for musicals--a modern rock-based show. Larson said his ultimate dream was to write a rock opera "to bring musical theater to the MTV generation." But even more groundbreaking is the show's subject matter: AIDS. Set in New York's Lower East Side, it is the story of a group of impoverished young artists and musicians struggling to survive in the thriving days of Bohemian Alphabet City, under the shadow of AIDS. Several of the characters are afflicted with the disease, at a time when there was little treatment or hope. The musical is a remarkable work of art but is made even more so because of Larson's death the night before the show made its off-Broadway debut. He died of an aortic aneurysym which went undiagnosed after three trips to emergency rooms. 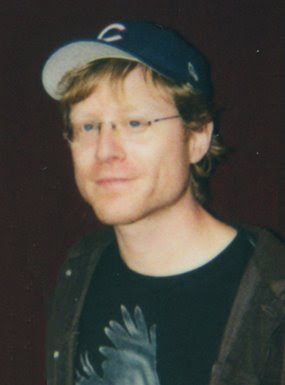 Rapp originated the role of the show's narrator, Mark Cohen. The actor was actually involved with the play in its infancy. He was cast in the role before most of the other actors appearing early on in the first seen limited three-week Workshop production at the New York Theatre Workshop in 1994. Rapp's book tells the story of the development of the show from the early workshop and his friendship with Larson. The musical is one of the most successful Broadway musicals ever and was made into a film in 2007, a fine example of a translation from stage to film where they are equally well done. The movie included most of the original cast including Rapp, Adam Pascal, the goddess/diva and Idina Mendel (Wicked), Taye Diggs, among other notable original cast members who have gone on to distinguished acting careers. Here's a video clip of a live performance by Rapp and Pascal, who originated the musical's two main leads, singing the song "What You Own" on the Today Show to promote the movie. Rapp's book is a beautiful, heart-wrenching, candid, soulful read about the musical's development, Larson's death and the emotional impact on the cast, Rapp's own acting career as a child actor, the death of his mother, as well as the actor's own evolution as a gay man. It was truly a beautiful exquisite book. At two points I was literally sobbing from sadness, the first as the actor talks about the performances the night after Larson's death and the second moment at his mother's death from cancer while he was still performing the show on Broadway. I seldom have that strong of an emotional response, crying, from reading a book. I frequently guffaw and laugh but books (unlike movies or tv) seldom make me cry. Adventures in Babysitting in 1986 and "several movies and Broadway shows, most notably as intellectuals. His notable work includes films Dazed and Confused, A Beautiful Mind, School Ties, Road Trip, the stage and film versions of Six Degrees of Separation, An American Family, Danny Roane: First Time Director and, You're a Good Man, Charlie Brown." (wikipedia). "The only way out, is through." This beautiful advice seems to me to be almost divine. This wonderful observation is given to Anthony by a friend who is helping him with the grieving process as his mother is dying. It becomes a process which defines much of Rapp's own evolution portrayed in the book, as the actor goes through a series of remarkable life-altering experience: the success of RENT, Larson's untimely death, his mother's slow and painful death from cancer, the actor's own youthful experiences of love. It seems to me that it is an "actor's" book. The Broadway musical is still running. You should see it. And see the movie. I was very impressed with director's Christopher Columbus' translation. It is much more current and of our time, without losing any of the original musical's brilliance. Read this book! Laugh with this book! Cry with this book! 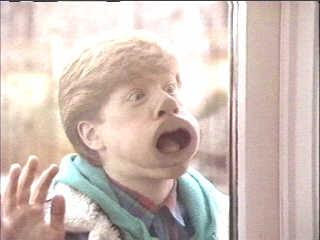 Relish every perfect word in Without You by Anthony Rapp, a very appealing, honest, interesting actor and human! The only way out, is through! A beautiful and enlightened way to live indeed.